The principals of Aha! Seminars, Inc., are published authors. You can find our books online at Amazon.com and other booksellers' sites. 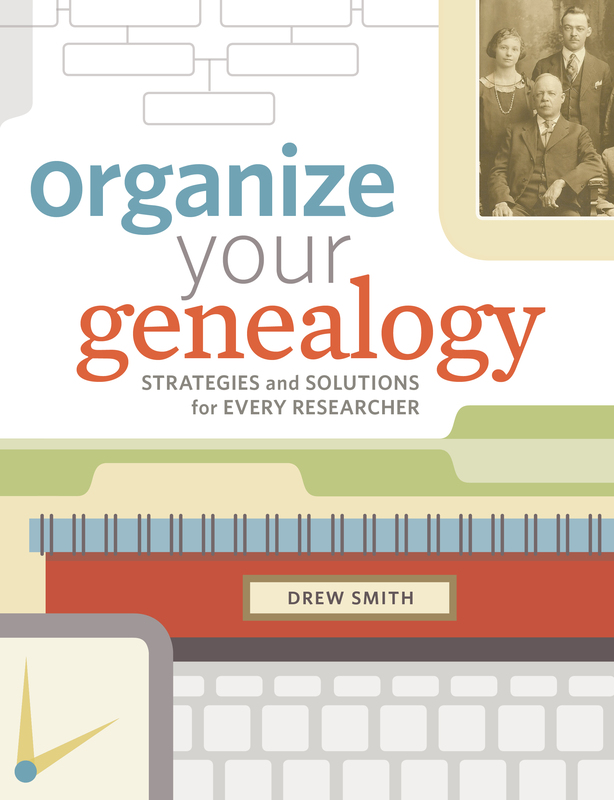 Drew Smith, well-known genealogical lecturer, author, and podcaster, has written the book, Organize Your Genealogy: Strategies and Solutions for Every Researcher, published by Family Tree Books. Stop struggling to manage all your genealogy facts, files, and data--make a plan of attack to maximize your progress. Organize Your Genealogy will show you how to use tried-and-true methods and the latest tech tools and genealogy software to organize your research plan, workspace, and family-history finds. In this book, you'll learn how to organize your time and resources, including how to set goals and objectives, determine workable research questions, sort paper and digital documents, keep track of physical and online correspondence, prepare for a research trip, and follow a skill-building plan. With this comprehensive guide, you'll make the most of your research time and energy and put yourself on a road to genealogy success. Whether you're a newbie seeking best practices to get started or a seasoned researcher looking for new and better ways of getting organized, this guide will help you manage every facet of your ancestry research. This is a must-have book for every genealogical researcher! 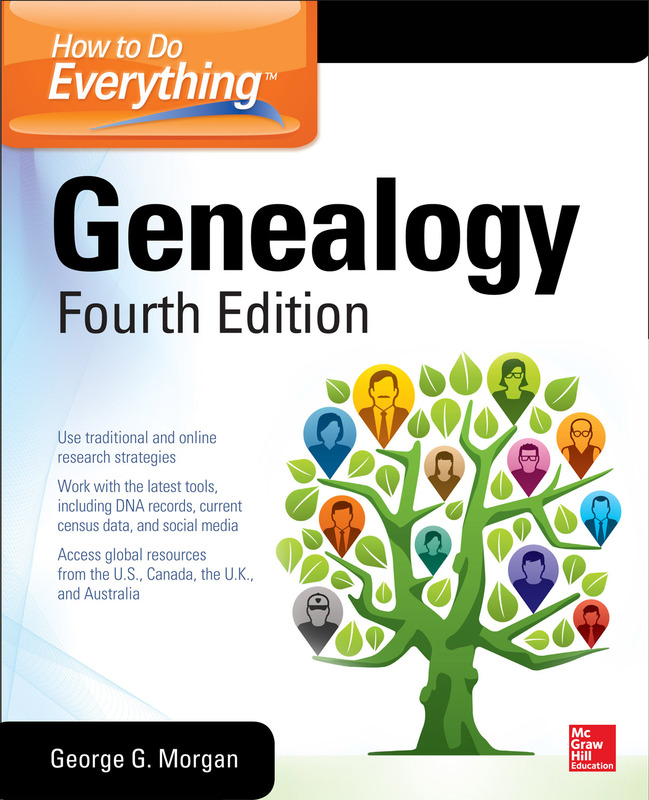 George G. Morgan's How to Do Everything; Genealogy is available in the new fourth edition. Published by Mc-Graw-Hill Professional in January 2015, this new book has been acclaimed as the best how-to book in more than 20 years. The book addresses genealogical research in the U.S., Canada, the U.K., and Australia, and covers scores of record types. It is generously illustrated with photographs, digitized documents, and webpage images. Hundreds of web addresses are included as references for your personal research and the newest technologies are addressed, including genetic genealogy (DNA testing) and social networking. Learn the methodologies for conducting the most effective research and how to evaluate the evidence you find. 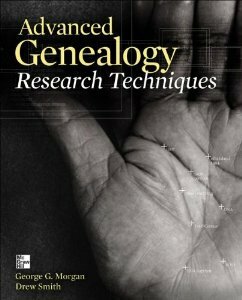 We are pleased to announce a new book, Advanced Genealogy Research Techniques, by George G. Morgan and Drew Smith. The book is published by McGraw-Hill and was released in softcover and Kindle formats in August of 2013. Advanced Genealogy Research Techniques uses up-to-date and highly organized methods and techniques to show you how to find the elusive details to round out your genealogy research. You’ll get past the brick walls that have stumped you and see how to move beyond basic types of genealogy resources. The book covers a variety of software programs and specialized genealogy tools and shows you how to create an online genealogical research log to preserve data found and organize it in ways to help you understand what you’ve uncovered. Nearly every form of modern social networking is addresses as is using DNA records. This practical, in-depth guide provides the next level of detail for anyone who wants to expand beyond the beginner tactics and techniques. This is the first book collaboration by George G. Morgan and Drew Smith, recognized genealogy experts, speakers, and authors. They are well known as the cohosts of The Genealogy Guys (sm) Podcast, the oldest genealogical podcast in the world and enjoyed by thousands of listeners around the world. 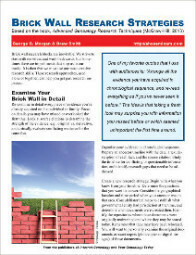 Based on the book, Advanced Genealogy Research Techniques (McGraw-Hill, 2013) by George G. Morgan and Drew Smith, their Brick Wall Research Strategies quicksheet offers professional advice on how to overcome those frustrating brick walls that are inevitable in the course of doing family history research. If you have ever felt like giving up on a “difficult” ancestor, the tips included in this guide will help you to recharge your research and help get you back on the road to success. It is available from Moorshead Magazines, the publisher, for $8.95. 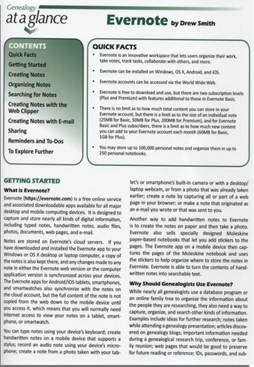 Evernote is an amazing tool for genealogists and you can learn all about it in this handy 4-page laminated guide by Drew Smith, author of the popular Social Networking for Genealogists. As Mr. Smith explains in this easy-to-use guide, Evernote may be the most useful tool in your research kit. What is Evernote? It is a free online service designed to capture and store nearly all kinds of digital information, including typed notes, handwritten notes, audio files, photos, documents, web pages, and e-mail. Synchronized across all your devices, including tablet, smartphone or smartwatch, it organizes everything from notes and files to blogs and Internet articles. In this clearly written guide, Drew Smith shows you how to do all this and more, including how to share information with family members and how to publish individual notes on social media sites. While nearly all genealogists use a database program or an online family tree, Evernote provides a unique way to capture, organize, and search all kinds of supporting information. Order from Amazon.com or Genealogical Publishing Company. George G. Morgan has written a "Genealogy at a Glance" quick sheet product about Ancestry.com Research for Genealogical Publishing Co. This new four-page, laminated publication is available for order here and sells for $8.95. It is a great reference tool for new and experienced Ancestry.com users. Order from the publisher or at Amazon.com. George G. Morgan has also written a "Genealogy at a Glance" quick sheet about FamilySearch.org Research for Genealogical Publishing Co. This new four-page, laminated publication is available for order here and sells for $8.95. It addresses all of the areas of "the new FamilySearch website" and shares tips for using wildward search characters, the FamilySearch Wiki, and more. 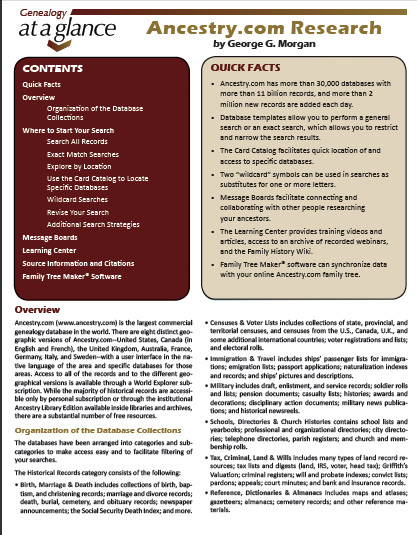 This is an essential reference tool for new and experienced users of FamilySearch.org. Order from the publisher or at Amazon.com. Drew Smith's book, Social Networking for Genealogists, is a landmark work that focuses on the newest electronic tools available to help genealogists further their research and collaborate with one another. Learn about blogs, wikis, social networks such as Facebook and Genealogy Wise, photograph sharing sites, podcasts and videocasts, and much more. This is the book you need to get up to speed with the world of social networking! Published by Genealogical Publishing Company. Family reunions provide wonderful opportunities to reconnect with family members and meet new members. A reunion can be as small as a few people at a backyard barbecue or picnic to a large event at a hotel or on a cruise ship. The planning and organization of a reunion can seem like a daunting task, but it doesn't have to be. 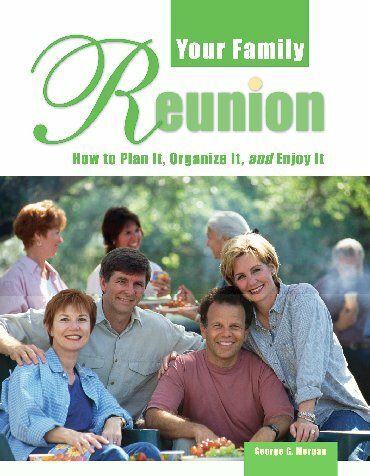 Author George G. Morgan is an expert planner and shares his many years of experience in Your Family Reunion: How to Plan It, Organize It, and Enjoy It. The book is filled with ideas for reunions and strategies for getting the work done. You may not be able to make everyone happy, but this book goes a long way to making putting on a reunion less stressful and more enjoyable for you!